Uddari welcomes the launch of Radical Desi, a new monthly magazine, and congratulates Gurpreet Singh and his team for initiating it. Below is the cover page of the first issue, an introduction and some information about its launching ceremony tommorrow. The launching ceremony will be held during Dialogue on Bhagat Singh’s Atheism. Those on the panel will include the author of Naastik Basni and a known atheist Sadhu Binning, the Centre for Inquiry leader Pat O’ Brien and the leader of the Canadian Taraksheel Sabha, Avtar Gill. Get free copies of the first edition of Radical Desi at the event. Those who are unable to attend will have an option to grab free copies at the parade being organized by the Guru Ravidas Sikh Temple in Burnaby on Saturday, March 22, 2014 and also at the annual community march against racism in Vancouver near Cambie and Hastings the same day. We encourage everyone to be there at 1:30 pm as we plan to start the event at 2 pm sharp. Each panelist will be given 20 minutes to speak. The panel discussion will be followed by Q&A session. Bhagat Singh was a towering Indian revolutionary- who was hanged by the British Indian government alongside Sukhdev and Rajguru on March 23, 1931. Bhagat Singh died as an atheist, yet there are attempts to appropriate his struggle by the religious fundamentalists within the South Asian community. The discussion on atheism and free thinking on his martyrdom day will be a fitting tribute to him. Please join us and feel free to ask questions to continue the dialogue that is necessary for the progress of humanity. 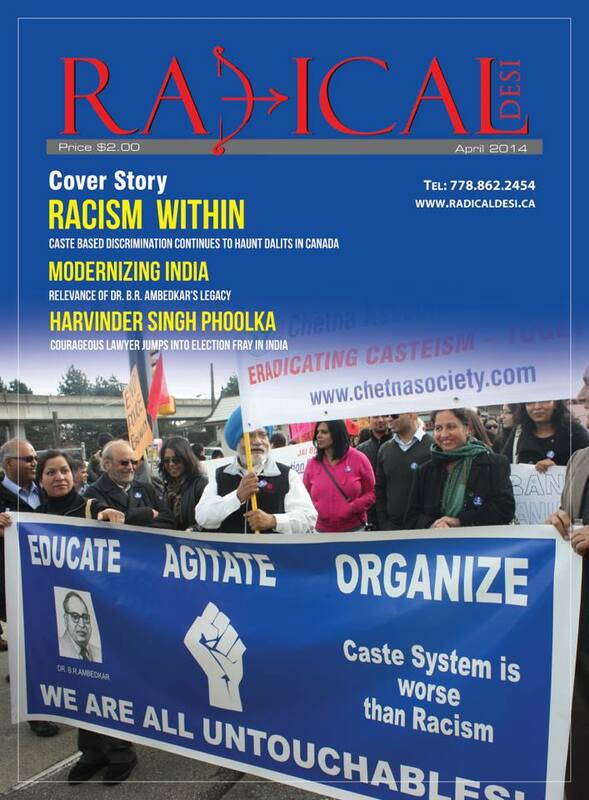 This entry was posted in Canada, Corporate culture, Events, Magazines, Politics, South Asian publishing and tagged Gurpreet Singh, Monthly Radical Desi, Welcome Radical Desi in Surrey this Sunday March 23/14.